Well, as far as my writing and reading goals, I crushed them! Other goals… not so much. But that’s the nice thing about a shiny new month. I can do better! My writing goals for March were to finish the rough draft for Against the Crown, write two new short stories, revise one of them, and hopefully submit that one. I didn’t quite get far enough to submit, though I should be there by the end of the week. The story I’m currently titling Imaginary just needs to be gone through for edits, preferably by another pair of eyes. I brainstormed, wrote, and revised it during the month. It’s a little story at 1,700 words, but I’m pretty happy with it. My second short, with my working title (NOT a final title) is Bad Imaginary, and was actually inspired by the same story sentence, but has a completely different outcome. Both stories have imaginary friends in them, but Imaginary has a good one, while Bad Imaginary has a bad one (shocking, I know. :-P). It’s also much longer with a bit over 3,800 words. As soon as I finish necessary edits on Imaginary, then I’ll start revision on Bad. As for Against the Crown, I finished it at 106,317 words. It’ll now cool its heels in the hard drive until I reach a point where I’m ready to revise the thing. It will need a sequel somewhere down the line, because there’s more to the story to finish off what I wanted to tell, but it was turning into a beast of a project that I wasn’t feeling I would be able to handle much longer. I’m expecting SOM will be a pretty long haul. 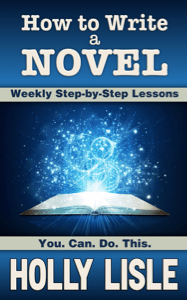 I’m going to be taking it through Holly Lisle’s How to Revise Your Novel course, and also compare notes from various readers who’ve given me feedback on the story. Though I’m calling this an edit, it’s going to be walking the revision line a lot more than I want. It’s possible this project will take me the better part of the year to finish, but I’ll see how the first read-through goes. Also, if any of my five short stories sell, I may pause edits and write another so I can keep five out there at all time. After I get through SOM, I’m planning on finally self-publishing it. Holly Lisle has a quote which goes something to the effect of, “Make it the best story you are capable of writing right now, then kick it out the door and work on the next.” I’ve been coddling SOM for so long, thinking one more revision will make it “perfect.” I’m over that, and I’ve come to terms with the fact that it will never be a perfect story, but I’ll never get the rest of the stories out there if I don’t finish this one. I’m going to get it as good as I’m capable of making it, and then move on with my career! So that’s what we’re doing! I’ll be going into where I’m at with the 2019 Reading Challenge in another post, but I’ve read 6 books for the challenge since my last update! If you’ve been following me for a little while, you may remember I mentioned a writing class last fall that I was taking. I’m going to talk about it again, because Holly Lisle is opening up the class for new students. It will only be open until 10:00 PM ET on Monday, April 8, 2019, and after this the price will go up. I used How To Write A Novel to help me through the brainstorming and early writing of Against the Crown. I ran into a snag partway through, because ATC was part of NaNoWriMo, I was writing way faster than lessons were being released, so I missed out on a lot of great tools and lessons that came later. But the lessons I did do blew my mind! I’ll be taking another novel through the class at some point, when I have time to do it ‘properly’. I completed ATC with the help of HTWAN, and if you’ve ever wanted to write a novel, but didn’t know how to go about it, this class will give you great step by step direction. You’ll have access to a forum of both new and experienced writers (plus Holly Lisle herself) who can help you when you get stuck. A quick FYI, I’m an affiliate of Holly Lisle’s, so if you buy one of her classes or clinics through my link, I get compensation for it. Since I’m saving up for her Fiction Marketing Workshop next, every little bit helps me get the next step in this writing journey. Been trucking along with the reading challenge over the last few months. I’ve read a lot of different stuff recently, and it’s been great fun. Had mixed feelings about this one. Overall, it was a fascinating book. I loved the world building in it and the differing angles things were approached from, but Artemis Fowl, the main character, drove me nuts. He was very arrogant and somewhat egotistical in a way that really rubbed me the wrong way. While the ending satisfied me somewhat in giving Artemis another facet to make him more likeable, he was still a hard character to swallow. However, a friend mentioned that he is a better person in later books, so I will pick those up eventually and give them a longer shot. My little sister used to love watching Mr. Rogers’ Neighborhood when she was little, and I watched my fair share of them, though I found them “boring”. What can I say, I liked my Danger Mouse and Chip ‘n Dale Rescue Rangers. Now as an adult, I see huge value in the show and in what Fred Rogers tried to do. The book was very emotional at times and gave great insight into a man with an amazing mind and a pure love of young children. While perusing the library shelves in the kid’s section a while ago, I stumbled across the Mistmantle series by M.I. McAllister and the first thing I noticed — A squirrel with a sword! Since rodents with swords is right up my interest alley, I grabbed it to read. (Confession time: I’ve read the first 3 books in the series now, but I’m not counting them as part of the challenge) There was a very “Redwall” feel to the books, given that you had animals carrying about their lives in a human manner, but one of the things I liked is that the animals sometimes had more animal tendencies. Lots more of dropping to all fours and whatnot. There’s plenty of humor scatter throughout. The book does have a very dark side that it explores in relation to the villain, but I found it very enjoyable overall! My husband and I watched Ant-Man and the Wasp a while back and I noticed in the opening segment of Ant-Man’s house arrest, he’s reading a book, and looking quite broken up over it, too. It took a little digging to find a still frame of the scene and a Google search to compare covers, but figured out the book after a bit. And yep, figured out why he was crying. Definitely bring tissues for this one. Since it deals with teens and cancer and life in general, it was not an easy read. While I disagreed with some of it on a religious level, the emotion of the book ran high the entire time and I was thoroughly emotionally drained by the end (and also had kids very concerned about why Mommy was crying). Are you working on Popsugar’s Reading Challenge? What would you recommend I read for the unfulfilled categories? I survived the snow-pocalypse. Our area has spend the last 4 days being snowed on, with only a break of a few hours between flurries. Today is the first day I’ve seen the sun since it all began. I think there’s close to two feet of fresh snow outside my door, and I’ve forgotten how many times I’ve picked up the shovel this week. The nice thing about being a writer is that I don’t have to leave the house to do my job, so the snow didn’t slow my writing progress. I revised 2 short stories this month, The Sea Lantern and Truth Keys (Called Magic Cloth for a while there). These were prompted by Holly Lisle’s class, How to Write Short Stories. I made a slight error in my scheduling this month by somehow assuming that I would be able to revise both stories within a week. I apparently did not pay attention to Holly Lisle’s section on “Writer Math” when I made my estimations. It took about 3 weeks to get through them, but they’re done now. Plus, I have finished the class by finishing 3 stories! Even better, all 3 stories have currently been submitted to 3 different online magazines! I’m doing my best not to obsessively check my email for replies from those submissions, but it’s super exciting to know that I have 3 potentials for publication out there at the moment! Against the Crown got shoved aside while I tried to catch up on revising, but I dove back into it this week. The word count hit 100,000 this morning. I did some brainstorming, and ended up having an epiphany about a way to tie the story up without needing another 100,000 words to get there. It does mean that I’ll need a second book to totally wrap up this story, but that’s a project for another day… or year… I figured out that 4 scenes remain to get the story where I need it to be, and then that draft can go in the drawer until I’m ready to revise it. I’m thinking the final word count will come in at about 110,000. Other than finishing up Against the Crown, March plans include more short stories. My goal is to have 5 short stories written and circulating among the publishers while I work on the bigger novel projects. When one story sells, I’ll write another to keep it at 5. I’m planning on spending March brainstorming new story ideas, writing 2 of them, and revising and submitting at least 1 of those. How many of you met your February goals? Any big accomplishments to celebrate? Well, I had an awesome January. It even started a bit late, since it took a couple weeks for me to get out of holiday mode and get back into all my routines, including changing a few things to hopefully maximize my productivity. I’ve always been an early bird and I’m using that to my advantage now. I get up at 4:30 AM every weekday morning. Two days I head straight to the gym to do my running and then my husband takes our oldest to school so I can work on my writing for an hour or so before the twins wake up. On non-gym days, I just start writing shortly after 4:30 and go until it’s time to get my daughter up for school. I take weekends off from writing, though Saturday is usually a gym day as well. I wrote two new short stories, The Sea Lantern and Magic Cloth and completed Holly Lisle’s How to Write Short Stories class. Seriously, if you want a quick way to write some short fiction and start getting it out there, this is the class you want! I think HTWSS has been the most beneficial of Holly’s classes since I started How to Revise Your Novel in 2016! Heck, it’s worth it alone for the lesson on how to revise short stories! I also reached a milestone in my running. I ran for 20 minutes solid, without slowing to a walk. Now with February well underway, I’m working on revising the two shorts I wrote last month, and have the goal to start submitting them before the end of the month. I’ve got one story currently submitted to an online magazine that I’m waiting to hear back on, and I’m planning on brainstorming a couple more by the end of the month. Against the Crown will be worked on in between those stories. I’ll be updating my word track counter to reflect my progress, so if you’re interested, keep tabs on that. How’d your January go, writing or otherwise? Back in 2015, I did a post on “Writing Tools” about the Emotion Thesaurus. I love this tool to break through those stubborn “Show, Don’t Tell” issues. To be honest, I’ve loved all the thesaurus books Angela Ackerman and Becca Puglisi have released over the years. So today, I’m bringing some exciting news from Angela and Becca at Writers Helping Writers: what the next book in their thesaurus series will be! The Emotion Thesaurus Second Edition! You might have heard of The Emotion Thesaurus before, or even have a copy. The original released in 2012 and quickly became the go-to guide on expressing character emotion. The book’s lists of body language, thoughts, and visceral sensations for 75 unique emotions made brainstorming character expressions and reactions so much easier. In this second edition, the authors have added 55 entries, bringing the total to 130 emotions. That’s not all, either. This book is almost double in size with lots of new content. You can find a full write up for it HERE and a list of all the entries (plus some samples!) HERE. Plus, this book is available for preorder! You can find it right now on Amazon, Kobo, Apple Books (iTunes), and Indiebound. Angela & Becca are giving away a free webinar recording of one of their popular workshops on Emotion, so head over if this is an area of struggle for you. It might really help! Every year since 2015, I have participated in the Reading Challenge put out by Popsugar.com. This year, of course, will be no exception. I really like this challenge because it forces me to read outside of my normal genre preferences. Yes, I love my fantasy, and will often find books that fit in that, but I’ve read so many other good books in the last 4 years that I never would have picked up otherwise! If you need to break out of a reading rut, or just need help finding something to read, I highly recommend this challenge. I’ve utilized the Goodreads group mentioned in the Popsugar article, though usually I just lurk and see what books people are recommending if I struggle in finding a book for a specific category. I’ve already gotten started on 2019, having finished 3 books. Skyward by Brandon Sanderson (A book set in space). Skyward is Brandon Sanderson’s take on the “Boy and his dragon” trope, but, in true Sanderson style, he twists it around. Girl and her sentient space ship, anyone? I loved the book, and greatly enjoyed digging into yet another Sanderson world, though I was less shocked by the twist than I usually am with Sanderson’s writings. Maybe I’m getting better at predicting the way his mind works. I was looking on the shelf for a different book when The Perfectly Proper Paranormal Museum caught my eye. Both the title and the very bright cover gave me pause and kind of made me giggle. I gave it a try, thinking it could fall under a couple different categories for the challenge, and I’m really glad I did. The book falls under the broad genre umbrella of a “cozy mystery” which I think I will have to pick up more of. The paranormal side is very light and the main character tends to brush off the paranormal happenstances as coincidence, but I found it right up my alley. I used to enjoy mysteries as a kid, and this book helped me remember just how much I used to enjoy them. My library made this one really easy, because they had an endcap shelf of “Debut novels” and so I just had to pick one that sounded good. I went with another mystery, this one being about the first murder on the moon. While it was a fun read, there was a little more sci-fi/tech speak than I like, which made for some skimming in a few spots. The characters were fun and quirky, and I did manage to spot the killer fairly early on. The cover is an annoyance, because I’m not entirely sure how you’d get a bullet hole in a space helmet in the vacuum of space (that’d be a great question for the old Mythbusters). It’s been a good start to the reading year, and I’ve got a couple more books already lined up for future reading. Are you going to join in this year’s reading challenge? If so, what categories interest you the most, and what do you think you’ll read for some of them? Get Updates When My Books Are Available!